I have a point vector layer with angle field. How can I create line segments at these points with certain length and angle? One possible tool is Geometry by expression in the Processing Toolbox > Vector geometry. project($geometry, 50, radians("angle")) part creates a new point by moving your points to "angle" direction by 50 meters. project($geometry, 50, radians("angle"+180)) creates another point to the oposite direction. make_line() ties the above two points, so the total line length is 100 meters. project() function assumes that your "angle" is measured clockwise from north, so this expression may require edits depending on how your "angle" field is made. NB. 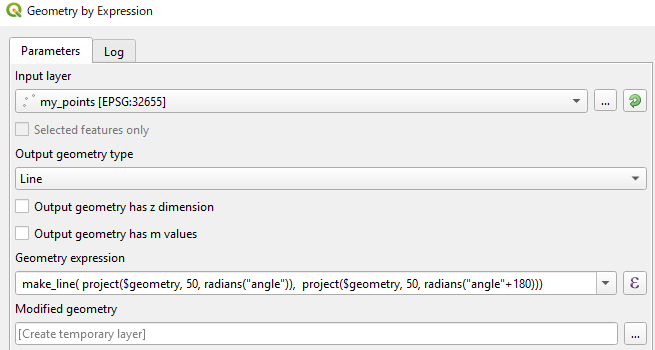 Do not forget saving created Modified geometry layer as a new dataset, otherwise it will be lost when you finish QGIS session. Not the answer you're looking for? Browse other questions tagged qgis point vector or ask your own question. 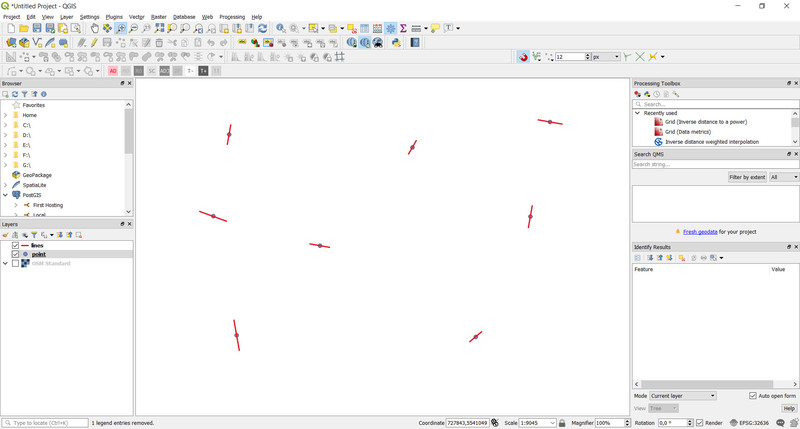 Create point and lines in QGIS 2.18? Creating new lines based on another line feature and point feature using QGIS?